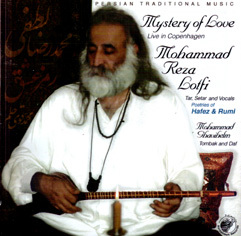 "Mohammad Reza Lotfi is one of the greatest contemporary masters of the tar and setar. He is among the major figures who, in the past twenty years, have revolutionized the Persian traditional (classical) music. His innovative approach of combining the classical with folk elements, both in terms of music and technique, has injected a new vitality into a very old tradition. His original creativity and the deep-rooted emotional quality of his playing have made him the father of a new aesthetics in Persian music. Lotfi was born in 1947 in Gorgan, northern Iran. Encouraged by his elder brother, he learned to play the târ and showed his talent by winning the first prize in Iran's Young Musicians Festival in 1964. The following year, he started his stadies at the National Conservatory in Tehran under Habibollah Salehi and Master Ali Akbar Shahnazi. while at the conservatory he also studied western classical music and the violin which led to his collaboration with various orchestras under the direction of Hossein Dehlavi. Some of his other eminent teachers were Abdollah Davami, from whom he learned the Radif, and Master Hormozi, who taught him the setâr While attending the College of Fine Arts at Tehran University, Lotfi became the student of Master Nour-Ali Boroumand. He also worked at the Center for the Preservation and Propagation of Traditional Iranian Music, both as a soloist and a conductor. His other accomplishments were teaching at the Center for Intellectual Development of Children and Adolescents, researching folk music for National Radio and Television, and appearing at the Shiraz Arts Festival. After graduating in 1973, Lotfi joined the faculty of Fine Arts at Tehran University. He continued his collaboration with Radio and Television and co-founded the Shayda Ensemble. Between 1978 and 1980, Lotfi became the Head of the School of Music at Tehran University. He served as the director of the Center for the Preservation and Propagation of Traditional Iranian Music and the Chavosh Conservatory. In 1984 Lotfi was invited by Fondazione Cini to participate in a seminar and perform concerts in Italy where he resided for two years. He has been living in the United States since 1986 and has performed widely throughout Asia, Europe, and North America. "